The Tampa Bay Lightning have been in this spot before, but that doesn’t make it any easier. When news emerged on Thursday that Steven Stamkos could miss four to six months after having arthroscopic surgery to repair a lateral meniscus tear in his right knee, the team knew they had to move on. As we discussed yesterday, the injury came on Tuesday night after Stamkos fell awkwardly against the boards. At that point, general manager Steve Yzerman noted that the team was in the process of evaluating its options. We also know that Tampa has been here before. Stamkos missed the last five games of the regular season last year with a blood clot near the collarbone. He was back for Game Seven of the Eastern Conference Final. Also, he missed 45 games in 2013-2014 after he broke his tibia. This injury stings, though, and a lot of that has to do with the contract he signed in June. The captain was on the proverbial bubble, with rumours swirling about possible destinations, but he eventually settled with the Lightning and inked an eight-year deal that seemed to be the start of something. Even so, it’s got to be hard to look on the bright side. 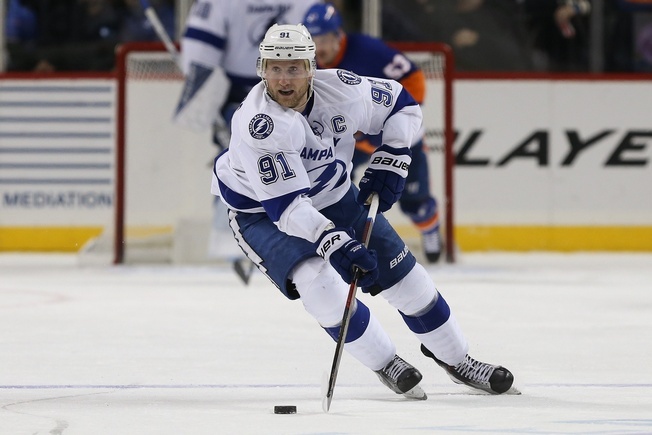 Stamkos was off to a great start and saw plenty of ice time with Nikita Kucherov. The deck will be shuffled in his absence, which could see a benefit for someone like Tyler Johnson or even Jonathan Drouin. Tampa is expected to bring Drouin back to the fold on their current road trip, so fans have to be hoping for more of the same out of him considering how well he did last time Stamkos was out. The injury to Stamkos could also see increased ice time for Valtteri Filppula, who should see a promotion to the second line with Drouin and Ondrej Palat. So, while Tampa certainly has the depth and capacity to weather another Stamkos injury storm, this isn’t a spot anyone wants to be in. Again.